I bet you are all wondering what is a pop up? A pop up store in particular. Based on the wikipedia definition, parang ang illegal lang ng dating ng pop up! Kasi nga there’s no permanent store, literally the vendors just pop out of nowhere. Okay fine, di naman out of nowhere kasi kundi parang street vendor na ang dating nun. Heehee. A mom pop up is a one day shop of select brands by moms for moms. Nice the idea noh? The pop up brands are curated by mompreneur organizers Rone Valles Guerrero and cousin Ines Lovina Santiago. Here’s the list of participating brands. Aside from shopping, there will also be activities for you and your kids. Not to mention a play area so that your active kids won’t get bored while mommies shop! Heehee. To give you more reasons to go, there will be a mom’s raffle where a loot bag worth over P5,000 will be raffled off. Everyone that registers at the Mom Pop Up gets an entry. A winner will be selected at random and the prize will be delivered to the winner after the event. Also, there’s an early bird prize. The first 3 customers of each vendor gets a free bundle of free online shipping worth P60 or more from all the vendors. You also get 5% off for customers that show the digital Facebook, Instagram or Twitter discount coupon posted by each vendor and participating blogger (that’s me!). Simply follow the #mompopup hashtag to get the coupon. 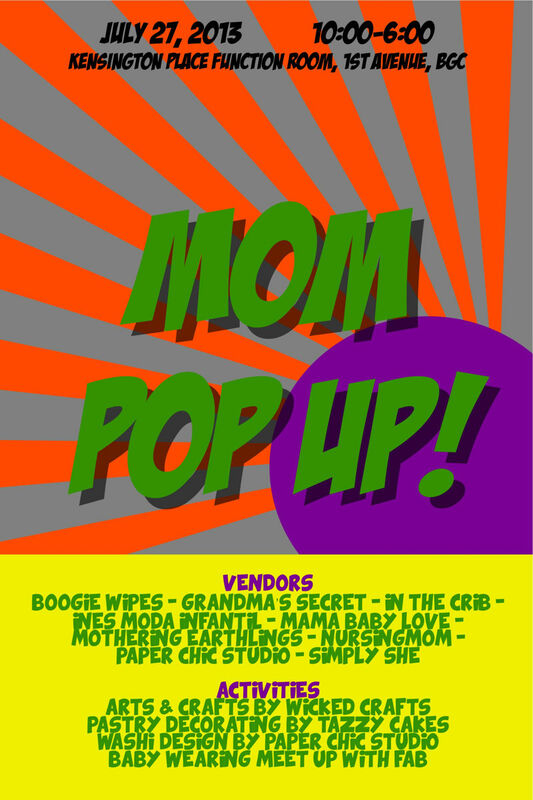 The Mom Pop Up is happening on July 27, 2013, 10 am to 6 pm at Kensington Place function room, 1st Avenue, Bonifacio Global City. Check the map below for reference. Thanks Jackie! Hope you and your family can make it.